The ‘Tibetian Book of Living and Dying’ by Sogyal Rinpoche was the inspiration that provided a structure to the cherished dream of the founder and led to the establishment of DEAN Foundation, an acronym for ‘To Dignify and Empower the Ailing and the Needy’. The Foundation was born out of a deep desire to provide compassionate love and care for the patients affected with chronic and terminal diseases and to make dying a transformative and peaceful experience. DEAN Foundation offers free Palliative care (area of healthcare that focuses on relieving and preventing suffering of patients) on an outpatient and home care basis, provide therapies to those suffering from life threatening diseases to ease their pain, counsel patients to prepare them to deal with death in a positive way and counsel relatives to help them overcome the fear of separation. It also maintains a database on allied health services in the city through referrals and networking. Deepa Muthaiya, founder and trustee, was the first Indian to receive the Children’s Hospice International Elisabeth Kubler Award for Outstanding Contribution in 2003 in the field of Pediatric Hospice and Palliative care. Donations: In FY13, donations accounted for 83% of total income. DEAN Foundation receives funds from individuals as well as corporates. However, as the amount of corporate donations cannot be quantified separately, all donations have been considered as general donations. DEAN recorded an increase in income from Rs1mn in FY12 to Rs7mn in FY13. The sharp increase in income can largely be attributed to the fundraising activities (such as setting up stalls & medical camps in public places, door to door campaigning and outsourcing to call centres to raise funds for Dean) undertaken in FY13 to the tune of Rs0.8mn (9% of total expenses). The fund raising expense was substantially higher than the average fundraising spend of Rs27,400 p.a. during FY10-FY12. Government Sources: DEAN witnessed an increasing trend in government funding during FY10-FY12 which rose from 25% to 73% of total income. ONGC was the major contributor in government sector. DEAN has entered into a MOU with ONGC to receive funding every three months. In FY12-13, the funds were received after a delay of six months as the MOU was under renewal. Hence, the funding from government declined to 15% of total income in FY13. 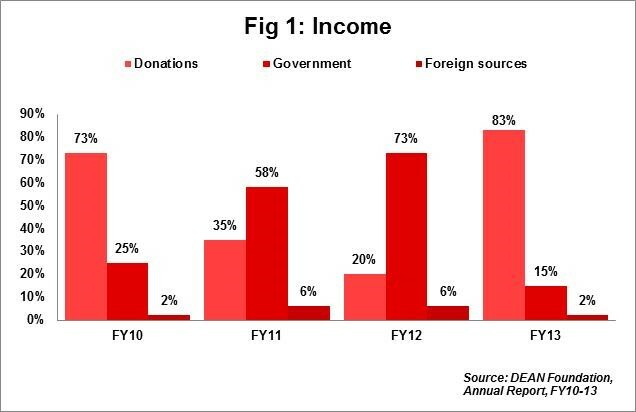 Foreign funding: Idhayangal Foundation had been the source of foreign income for DEAN during FY10-13. The foreign funding has declined from 6% (Rs0.4mn) in FY12 to 2% (Rs1mn) of total income in FY13. DEAN has listed with Silicon Valley Community Foundation to raise foreign funds through them in future. (Ref Fig. 1). Sales: Income included under sales and sponsorship comprises of proceeds from sale of scrap. Direct Programme Expenses: In FY13, total expenses aggregated Rs10mn. Total spends for beneficiaries was 45% of total expenses. DEAN spent 17% of total expenses on programme activities (sector average: 47%). 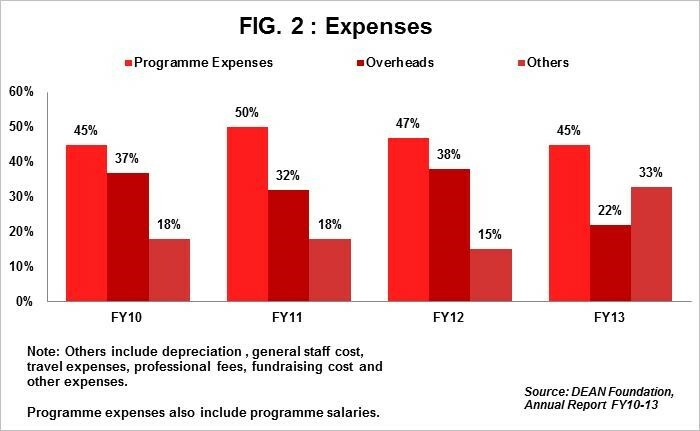 Programme staff cost accounted for 28% (Rs2.8mn) of total expenses in FY13 in the line with the sector average. DEAN has managed to control staff cost to an extent as programme staff cost at Rs2.5mn in FY12 was 32% of total cost. DEAN spends a sizeable amount on staff cost as treating patients with chronic and incurable illnesses requires qualified and skilled staff. Also, staff for palliative care is not easily available and hence the existing staff needs to be retained by incurring additional cost. Overheads: Overheads include expenses incurred towards rent, electricity, interest, and fuel charges to name a few and accounted for 22% of total expenses in FY13 (sector average: 14%). Expenses on overheads have decreased from Rs2.8mn in FY12 to Rs2.1mn in FY13 indicating improved utilisation of funds for programme activities. Other Expenses: In FY13, 5% (Rs0.5mn) of total expenses pertains to loss on revaluation and scrapping of assets. (Ref Fig. 2). Current Assets: Current Assets accounted for 19% of total assets in FY13. Current assets have increased from Rs0.6mn in FY12 to Rs1mn in FY13 on account of an advance made to MPL Automobiles for purchase of vehicle for the home care project. Trust Corpus: Funds set aside as trust corpus increased marginally from Rs4.1mn in FY12 to Rs4.3mn in FY13. Trust corpus accounted for 53% of total funds in FY13. Loans: Loan funds accounted for 45% (Rs3.6mn) of total funds in FY13 as against Rs3mn in FY12. Loan funds include loan taken from members to the tune of 48% (Rs1mn) of total loans in FY13 as against Rs3mn in FY12. Better cash inflows have helped repay two thirds of the loans from members. Income Growth rate: DEAN posted total income of Rs9mn in FY13 registering an income growth of 29% as against the negative growth of 3.4% in FY12. The NGO’s income witnessed CAGR of 24% during FY10-FY13 mostly driven by the 4.6x Y-o-Y spurt in donations in FY13. Dedicated staff: DEAN Foundation has a dedicated staff of 42 including two full time doctors, one part time doctor, four nurses, two administrative officers, three drivers and other essential staff. Self-sufficiency ratio: The ratio measures ability of an organisation to meet expenses from its own funds. Own funds include individual donations, sales and interest income. Own funds account of 84% of total income in FY13. Hence, the self-sufficiency ratio is 84%. Repayment ratio: The repayment capacity ratio is 75%. This Indicates ratio of own funds to total borrowings. Own funds include corpus funds and accumulated funds and excludes unrestricted funds. In FY13, 48% (Rs1mn) of loan funds were borrowed from its own members (Rs3mn in FY12). Lack of funds: DEAN faces shortage of funds for an inpatient hospitality centre. Staff constraint: Retaining already trained medical and non-medical staff is a challenge. Also, medical professionals are not readily available due to non-lucrative nature of work. Space constraint: Owners are reluctant to let out their premises on rent to dying patients considering it as inauspicious. Negative approach: The ailing patients are referred to DEAN at a very late stage making it difficult to enhance the quality of life left. Also, lack of positive approach for the concept of professional care for terminally ill among the Indians is yet another challenge. The Governing Board of DEAN Foundation comprises a three member team of Ms Deepa Muthaiya, Dr. Ravi Sundar George, MVSc., Ph.D., Professor - T.N. Veterinary & Animal Sciences University and Mr. P.S. Govind Rao, G.D.Arch., A.I.I.A., F.I.I.A, Architect. These members oversee the activities of the Foundation. In addition to this, DEAN Foundation has constituted a Technical Advisory Committee comprising of eminent specialists from different medical, paramedical and professional streams of work. Technical inputs for the progress of Palliative care and DEAN Foundation are provided by the committee as and when required.